In yesterday’s weekend recap I briefly mentioned that during our drive to the Grand Canyon, Hannah and I were the unfortunate recipients of a flat tire. For some reason, Hannah and I can’t seem to be together without some sort of unnecessary car issue happening (last year we hit two coyotes while driving to Carlsbad Caverns National Park in New Mexico). It was quite funny and terribly expensive all at the same time. Anyway, we had just begun driving up the switchbacks which start in Oak Creek Canyon and lead into Flagstaff, and I accidentally went off the curb a bit, and when I drove back onto the road the wheel frame was bent on the curb and caused a flat tire. It started humming pretty loudly, so we knew something was wrong and we pulled over to check it out. Not surprisingly, it was flat, and after further inspection we determined that we probably wouldn’t be able to change it ourselves. 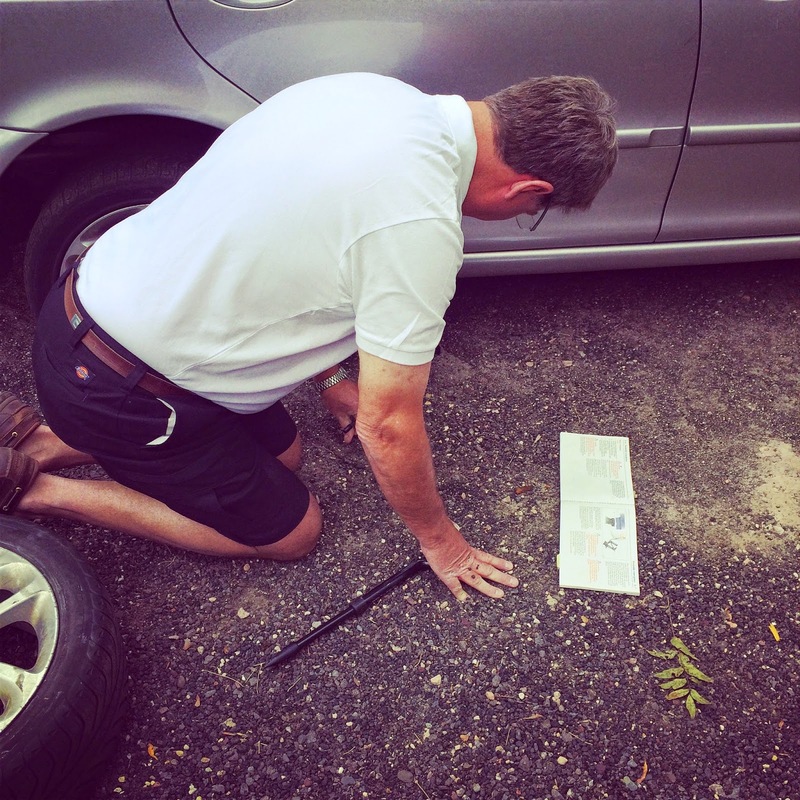 I called John right away and he started making calls to AAA and tire shops in the area to come help us out, but we were hoping we could get back on the road without too much of a delay... Ideally, someone would pull over to help us, but no one was stopping. We figured we needed to look more distressed to get people to stop, so we got out of the car, pulled out the spare tire, and pretended like we were reading the owner’s manual. 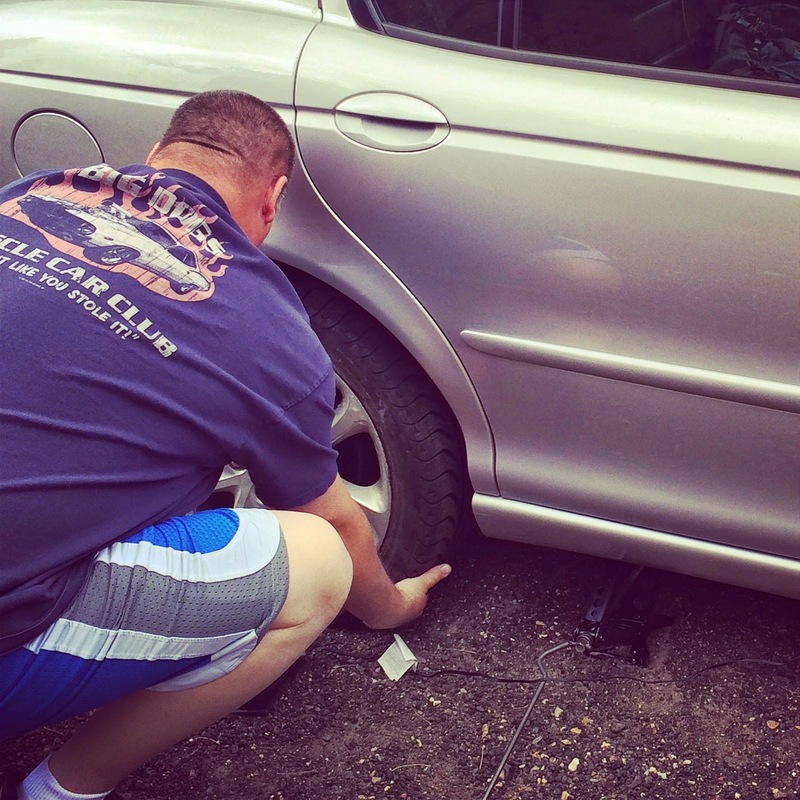 Very shortly after that, a couple on their way to the airport stopped and changed the tire for us (they said we looked like their daughters… whatever works, I guess!). 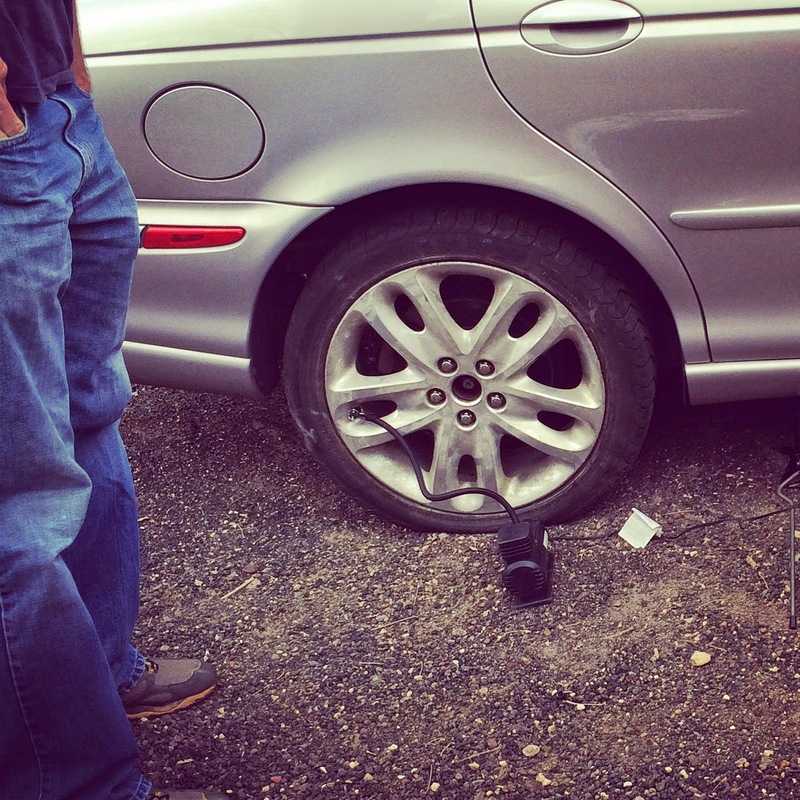 It was all going well, until we discovered that the spare tire didn’t have enough air in it. They put the tire on anyway and went on their way. Not long after, another couple stopped to assist. 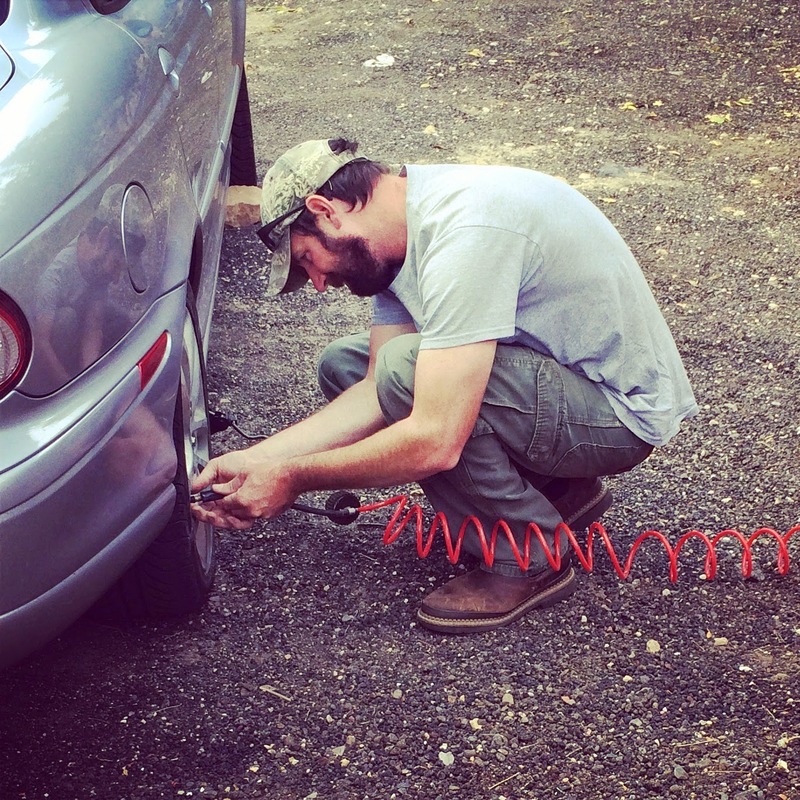 They had a small air pump that they used to try and blow up the tire. It took a while to work, and while we were waiting another guy drove up and basically just stood around and supervised the situation… he hugged the tire, told us about his kids (who apparently we also look like…), and really just seemed like he wanted to hang out. And people kept coming… I swear, once one stops, six or seven stop! Another man rolled down his window, and we just waved him on – it was getting overwhelming! Finally, the little pump started smoking and basically died, but I got a call from John saying that someone from a tire shop was on their way to help us. While we were waiting for them to get there, another person drove by and said that he worked at a tire store and would fix the tire for us (unfortunately, my rim was bent so I couldn’t take him up on it), so instead he used this large compressor that he had hanging around in his car (what?) to blow up the tire. After he left, we decided we should probably wait for the real tire people to get there before we went on our way just to make sure everything was okay… Finally he arrived and gave us the a-okay, and we were off and running! Thankfully, the spare tire was full size and looked identical to the other tires, so we didn’t look like freaks driving into the Grand Canyon with a terrible donut on the car. Apparently it really does takes a village. Anyway, I say all of this because as great as your destination may be, the real adventure is in getting there. This reminded me of a Lord of the Rings quote that was in my most recent Beth Moore study (Children of the Day). Gandalf the wizard says to the hobbit Bilbo Baggins: "I am looking for someone to share in an adventure that I am arranging, and it's very difficult to find anyone." Bilbo Baggins replies: "I should think so - in these parts! We are plain quiet folk and have no use for adventures. Nasty disturbing uncomfortable things! Make you late for dinner!" In the movie The Hobbit, a disgruntled Gandalf speaks: "You've been sitting quietly for far too long. Tell me; when did doilies and your mother's dishes become so important to you? I remember a young hobbit who always was running off in search of elves and woods, who would stay out late, and come home after dark, trailing mud and twigs and fireflies. A young hobbit who would have liked nothing better than to find out what was beyond the borders of the Shire. The world is not in your books and maps; it's out there"
And while I may not be all adventure (because, after all, I love me some dishes and doilies too), I certainly appreciate (or at least have come to appreciae) running off in search of elves (none to be found ...yet) and woods, staying out late, and coming home after dark, trailing mud and twigs and fireflies. What an ordeal - I can't believe how many people were willing to stop for you!! My faith in humanity is restored!! It really is all about the adventure! Glad to hear it all turned out ok and you had so many people stop and be willing to help! I love the section from beth Moore's new study. 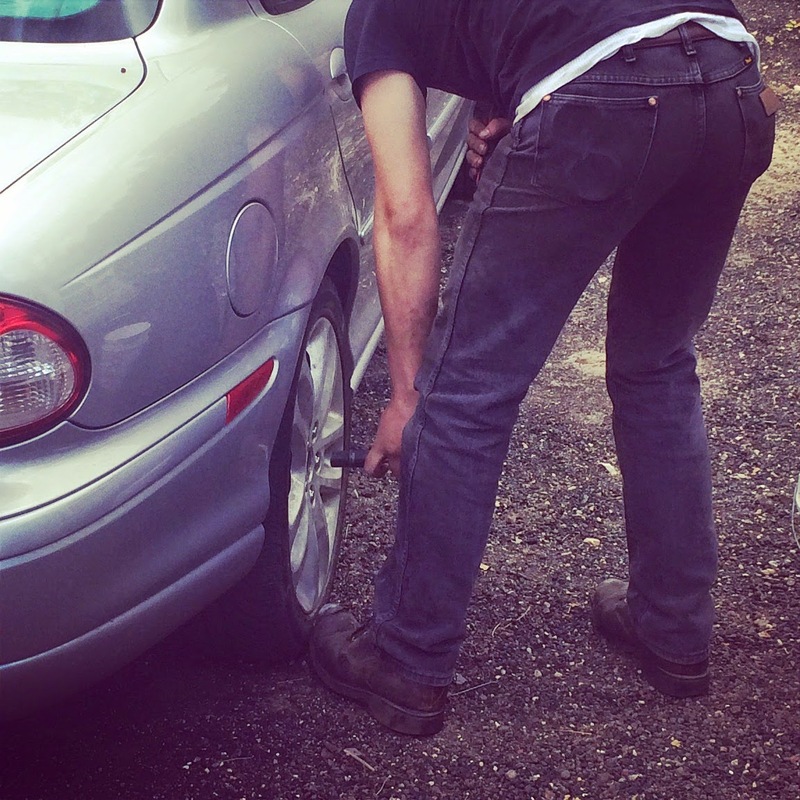 Also I would have NO clue how to change a tire. Holy moly!!! This is quite the adventure. I'm surprised so many people stopped. That's awesome that so many people were willing to help. Glad you were able to make it there eventually. Oh my goodness, not good! That is really great that they all stopped to help though :) I'd be in trouble! That story is hilarious! That is so nice that so many people stopped to help! The World is filled with kind people! What a story! I'm not sure if I would've died of laughter or embarrassment as all the people started stopping. Is "Children of the Day" good? I so want to do that study! Flat tires are the worst!! Great that it turned out ok! Ohmygoodness!!! Girlfriend!!!! I can't believe you were so willing to let strangers help you in the middle of the dessert!! I would have rolled up my windows, locked my doors, and pretended like I didn't see anyone stop! Thank goodness everything worked out and ya'll have a memory to cherish! So sorry about the flat tire, but you're so right about being able to look at the bigger picture and take something out of it. I love that so many people stopped to help and genuinely cared! Did the guy actually hug the tire? That's kinda strange, isn't it? Glad y'all got it taken care of! I'd be out of luck if no one stopped.